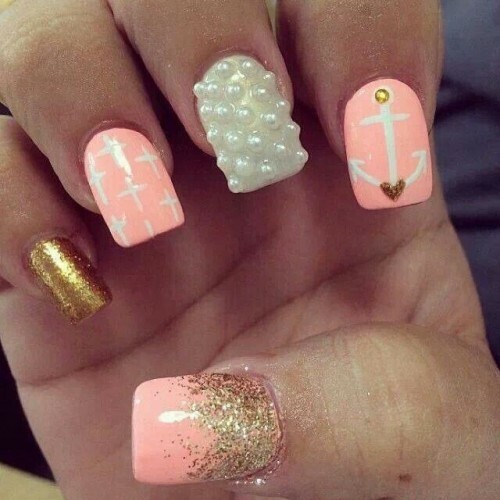 Nail art designs are quite a popular thing amongst girls these days. You can try out the various form of this easily at home if you have a few craft supplies with you. You can also buy special materials from deco stores and also various other things can be easily applied to the nails to make them shower. If you do not like to put many types of things which may be quite difficult and makes your hands feel uncomfortable or you think that they may come off if they get stuck to clothes, then also there are other things that you can use. Things like drawing the patterns using a brush over a selected colour can be done. You can also buy cheap decals which can be transferred using some water. You will be able to use some special nail paints which come with diluted glitter particles and also holographic particles of foils. 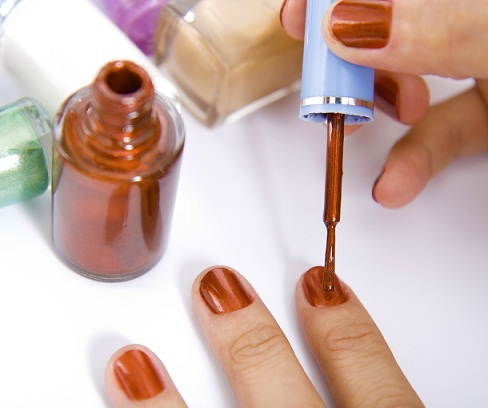 Those can be applied like a normal top coat and still you will get a very good effect with that. These are easy to apply over normal colours. 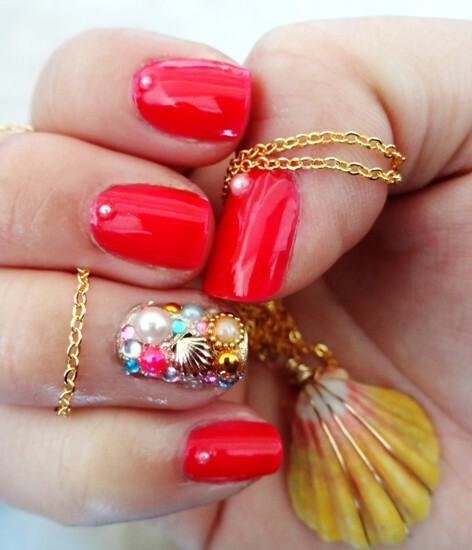 Sometimes simple colours can also be a popular manicure for you. You can try doing various types of things and therefore you will be able to do these even if you are a beginner or even if you do not know properly how to draw. 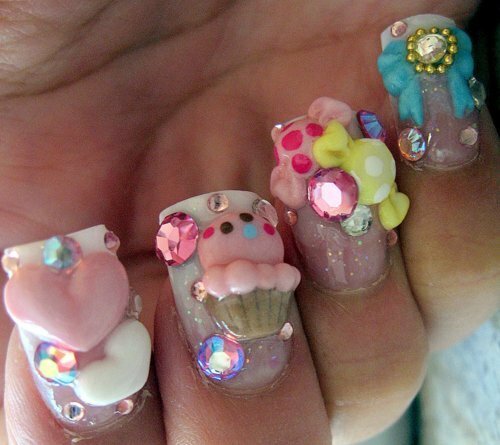 Below are the top 100 different types of easy and simple nail art designs that you can try out for various occasions. These are easily done even if you are a beginner. 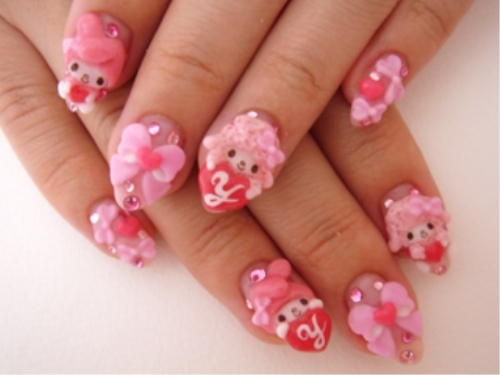 For some of the nail arts, you will need to buy some deco materials which you can buy from special shops. If you have good hand at drawing then you can try the free hand patterns shown below step by step. 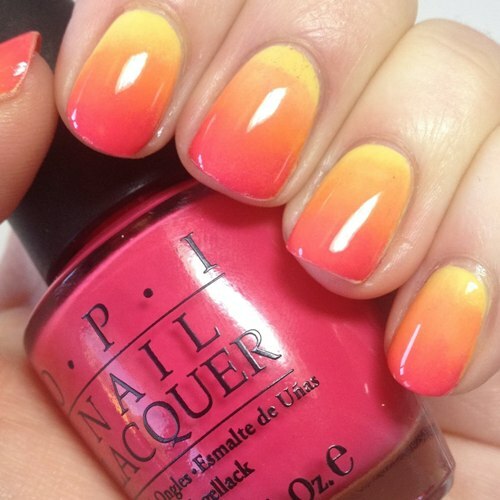 This is awesome nail art design will remind you of the night and the sunset. 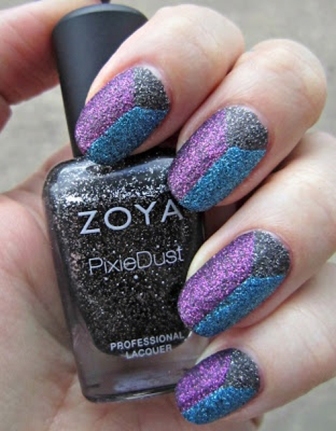 This has been done using Zoya Pixie dust nails Lacquer and sand nail polishes. Sand finish nail polishes give you a sand life effect, which seems as if you have really applied some sand on to your nails. These have been recently launched in India and are quite costly. However, you may try out this unique nail art using 2 colours of sand nail polishes viz. 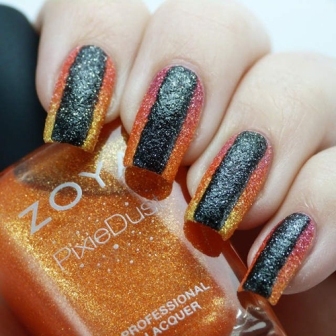 Black and Glitter sand nail polish from Zoya in orange or yellow. Additionally, sponge up a red colour or a pinkish tone on to the top portion. Use the black in the middle. Do not use a top coat for this one. That is essentially because you do get to see the glitter, that gets wasted otherwise with an extra layer of protective top coat. The flowers are all different and unique, but the pattern is similar with four flowers cupped together on each nail at varied places. 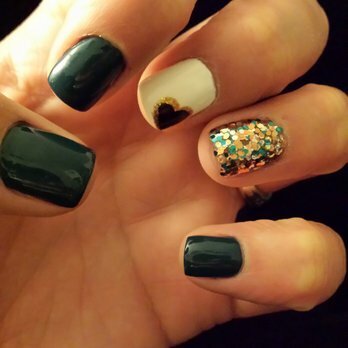 You can try out this nail art by using golden nail polish as a base and some black special polish. Use the special polish to stamp out floral designs from a definite stamping plate. Looks very beautiful and easy to do. 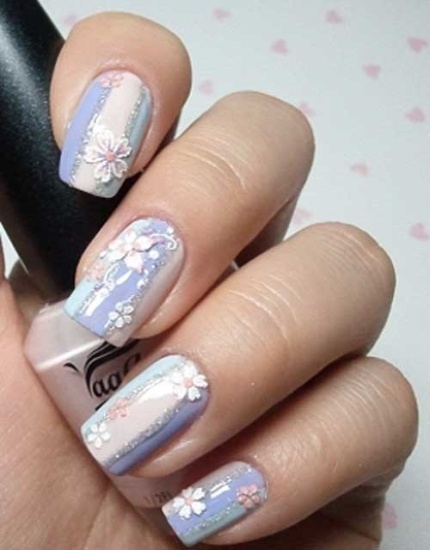 These types of nail art designs can be created using water decals of the above pattern on to white base paint. 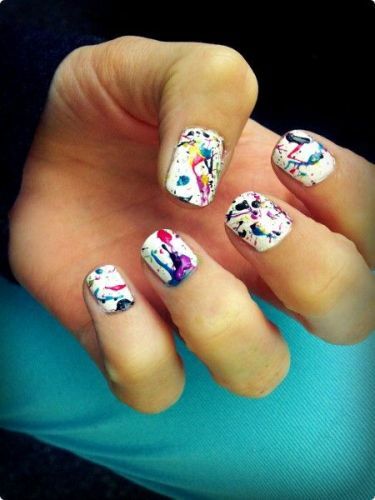 You must finish this design with a good top coat application otherwise your whole effort will be wasted in a short time. The nail paint can have Aztec paint like this or you can flaunt your favourite character from any TV show in its teensy form as well, whatever suits you best. 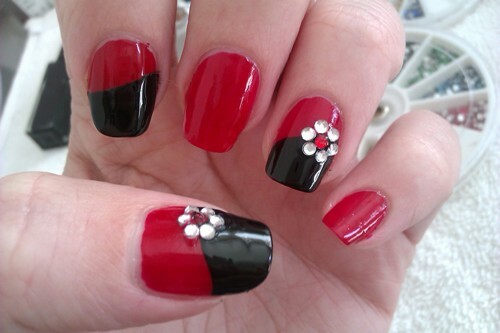 You can create this nail art by using sand nail polishes in red and black from Zoya. You can additionally create patterns and add some rhinestones for the Bling effect. For the nail colour, as you see, two fingers have flowers while the other three don’t, not that it is stealing away the show for any less. This nail art can be created easily by using 3 different shimmer finish colours of high-quality nail polishes and a sponge. You will need metal finish nail polishes for this nail art. Use a top coat to cover and seal this design. The effect is very ombre-like, so when you are bored of the same unicolour design, this one is your ticket to standing out for good reasons. This can be a look that you take along to the beach for the day. This is another sand finish nail art done using 3 different sand finish nail polishes from Zoya. 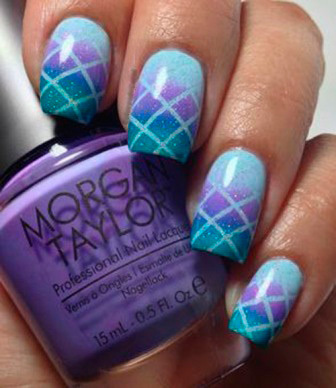 You can create this design by using scotch tapes so that one colour doesn’t smudge on to the other. While you might think violet and blue don’t settle well with each other, that evidently isn’t the case always, as you see how different this look is and it is equally unique. First the bad news, this nail art has been created using KB Shimmer Candy Cane crush nail polish which has different coloured sequins in it. This nail polish may not be available in India. However, you can create a similar splatter effect with loose nail art sequins or use a nail art brush and split the required colours on to the nails by diluting little bit of nail polish on a palette mixed with a little bit of nail remover or acetone. The choices of the colours here are great and as you can clearly see, the black and white are complimenting each other on an excellent note. This is an amazing nail polish if you can get your hands on this one then this manicure is just a swipe away. 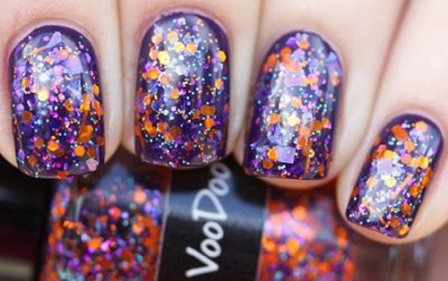 The top coat is important for this one because you do not want the glitter flying around everywhere. Also, the top coat colour needs to be transparent to look flawless. 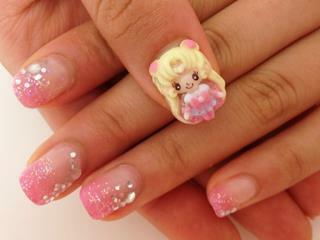 However, this is one of the best manicures that you can come across. 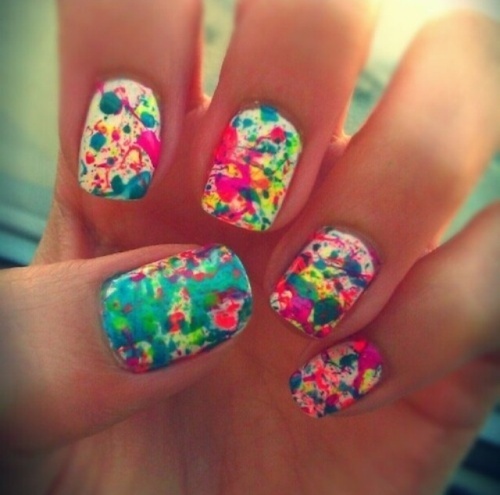 You don’t always have to be very creative while creating nail art. 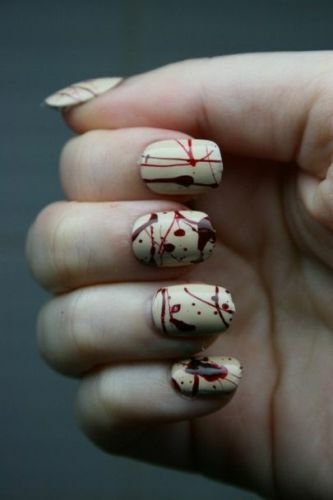 This nail art is an example of that. 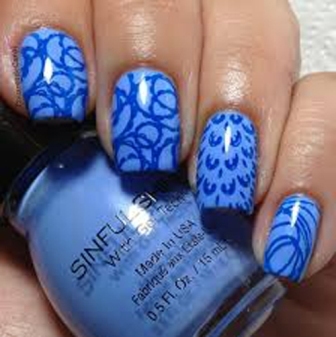 Use your special blue stamping polish and light blue base paint. This has only one colour and still manages to impress. Speaks volumes about how even the simplest things can work wonders. This can be easily done with the sponging technique and striping tape. The striping nail arts are easily available and with online shopping doing the rounds, it should be as easy as a day for you to get hold of one. Try it! 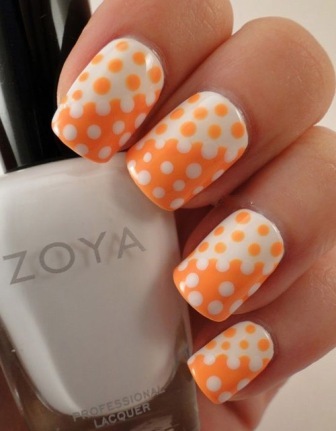 Orange and white polka dots give off a very pleasing feel and a retro touch to the nails. You can sport this look at theme parties and garner quick praises. 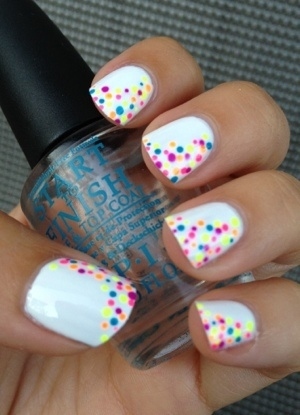 Very trendy looking nail art and yet very easy to do with your dotting tools. 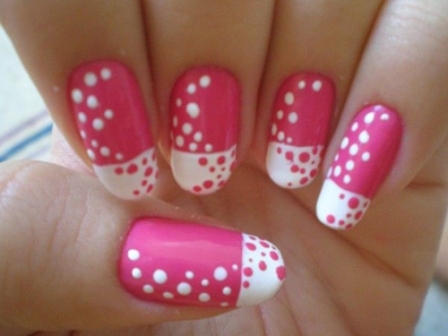 A lovely looking nail art which can be easily created with two colours of nail polishes and your dotting tools. 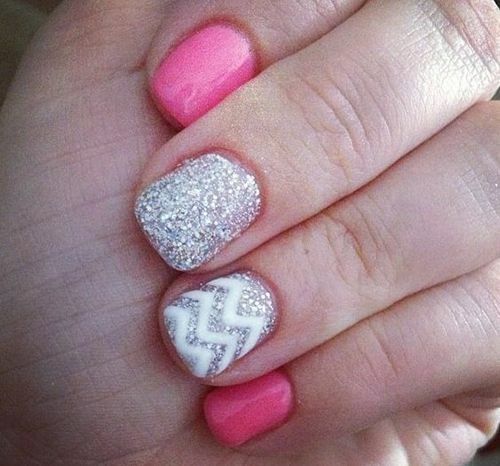 The two colours overlap with the pink and white looking a cute appearance. You can wear this nail colour at random events that don’t need too much of dress up details. 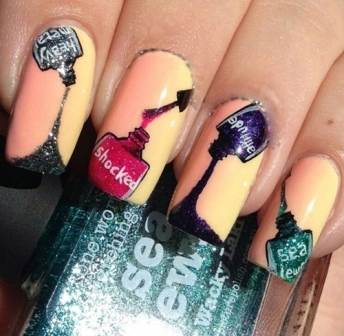 Would you try this nail art design out? 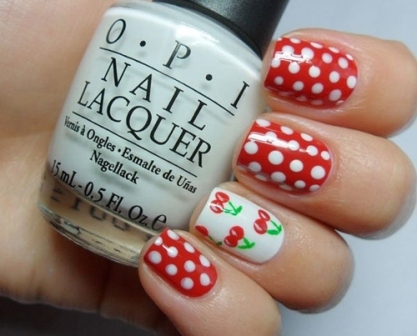 You need to have either water decals for those little cherries or you can also use freehand painting or some dotting tools. 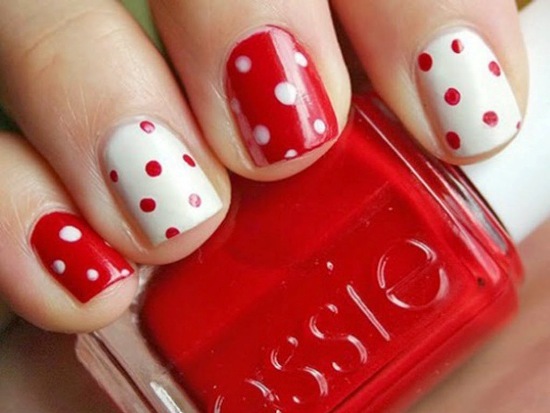 When it essentially comes down to the white and red polka dots, that one finger with the plums’ just what takes the deal away in the end. The best way to look absolutely gorgeous with this nail colour is to make sure your nails are long enough, else it looks very crowded, which isn’t quite a happy thing you should know. 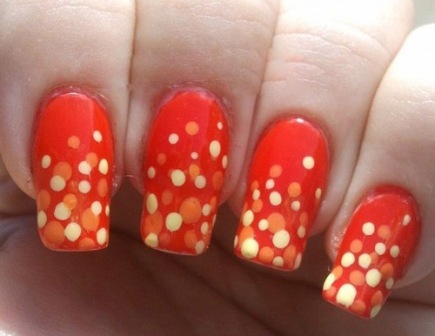 You can create a burning flame type splatter nail art by using your dotting tools. Try this design out. 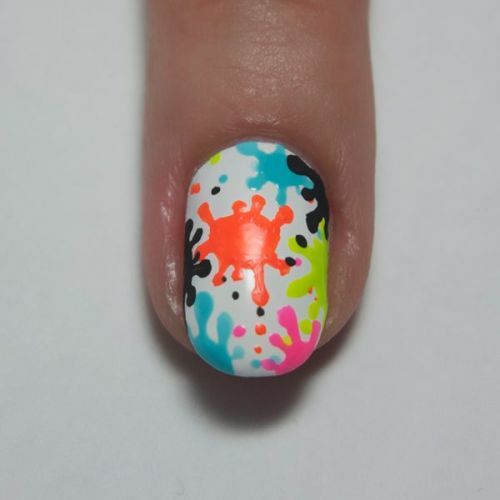 You can give this design a try by using different colours of nail polishes. 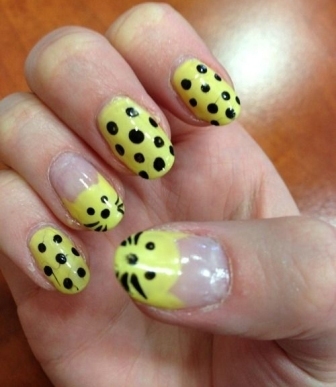 Use your dotting tools to create those leopard prints. Keep a sponge around to give this design a finishing touch worth the time you spend putting all of it up and bringing them together. This one looks like mini DNA results that doctors usually have around their homes experimenting with. In any case, it manages to impress equally well all the same. 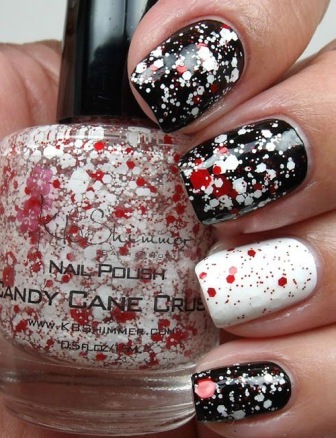 Try out tiny dots of different colours to create a splatter nail like the one above. 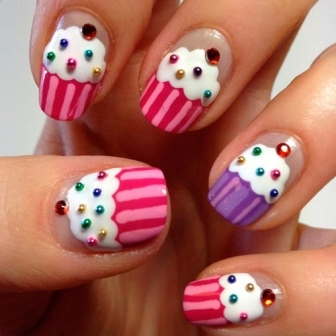 Use your nail art brush, some caviar beads and rhinestones to create cupcake nails. These are very easy to create. You will need your dotting tool or a toothpick for the cake curvature. For Christmas this time, you know just what to do to impress your family and friends and be the centre of attention the whole time. 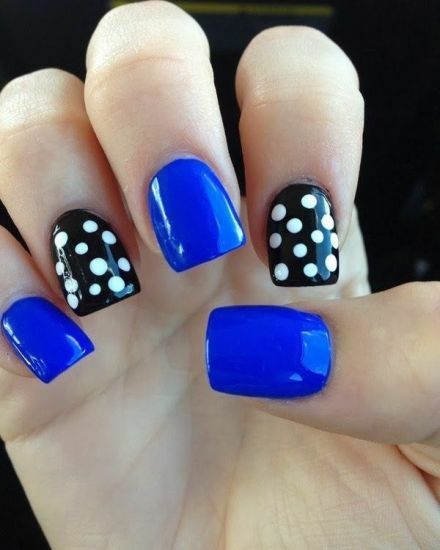 The only thing you need to have around is a brush to get the dots perfectly and different shades of nail colours that blend well with the white initial colour. 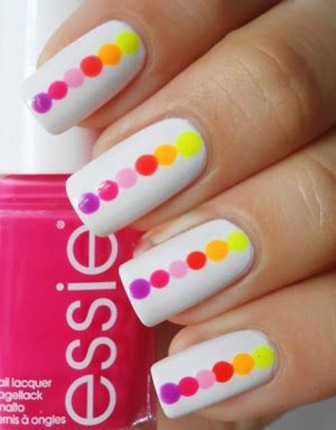 You can easily create this type of nail art by using lots of different colours in a line with your dotting tools. This look is more of an aquatic one and very creative at that. It features the two favourite shades of blue for most. 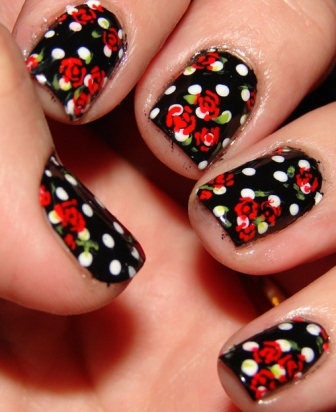 This is another easy polka design which you can try out using just your dotting tools and it looks awesome. 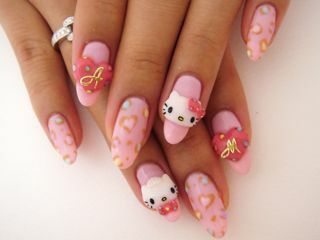 This might although, we admit get a little hard to draw and create all by yourself, so its best that you find an apt nail parlour and let their professionals work on your fingernails like a charm. 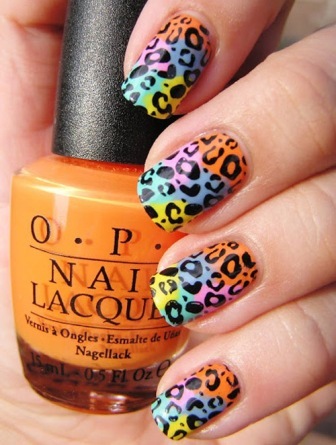 If you have good hands at drawing on nails, then you can try out this design using acrylic paints and a nail art brush. 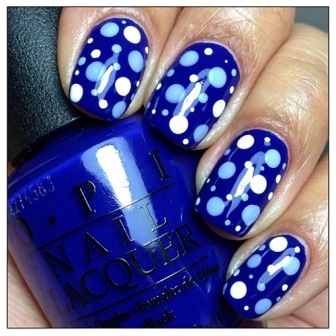 This is an easy version of Ombre nails using dotting tools and colours in the different density of shades of blue. The face shop is one of the best cosmetic companies doing the rounds, so you can be sure that the beautiful look that you get from this nail colour will stay around for quite a while. This nail colour essentially has the two colours cream and white to brag of. But, you can choose a different base as well, as long as you change the tone of the highlight colours. 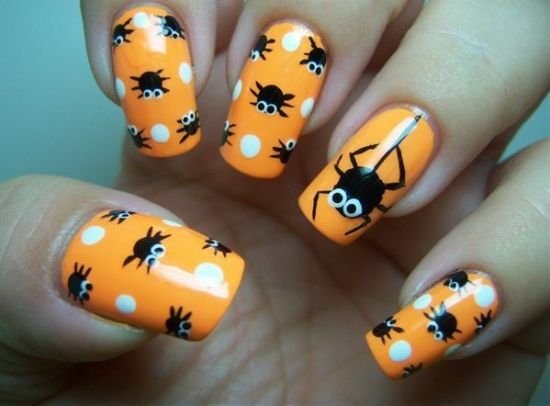 This is easy to do Halloween nail art using different nail decals and stamping. Some freehand painting is also involved. Use some sequins of square shapes for additional decoration. However, if you cannot get stamping plates of required designs you will have to go fully free hand for this one. 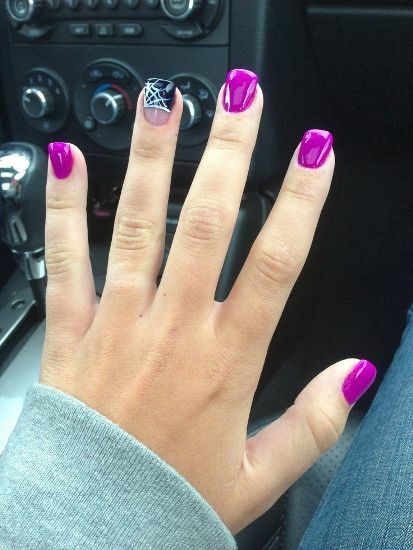 The nails are well shaped and manicured, so that’s a big plus point to brag of in the end if you ask us. This is an example of bridesmaid or bridal nails in French tip style. Acrylic flowers have been created and some pearls have been used using transparent polish. Stencils are not yet available in India, but if you can create some stencils with scotch tape and scissors then it will be good for nail art. You can skip the stencil on all fingers if it gets too hectic as well, and still manage to uniquely flaunt your style. You can reuse stencils too. This design has been created using the sponging technique and stencil star design. The Aztec thing going on alongside is such a bonus as well. 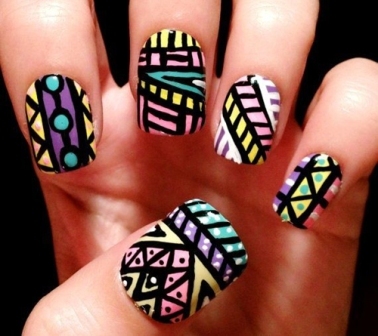 You can try out tribal nails by freehand painting. 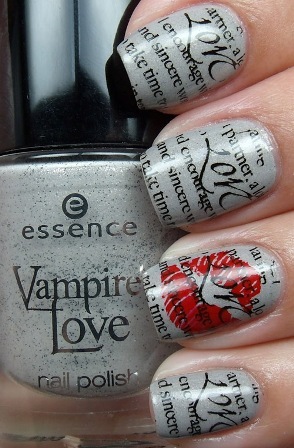 Use acetone for getting the newspaper print out on nails over a base coat. Additionally, use some kiss decals or stamping kit for the kiss design. You can team the look up with a white or a black dress to steal the show in the classiest way possible. This will remind you of 80’s polka design dresses. Try this out. All the fingers feature a different style with this one and you can rock this look for a long time with a lasting top coat to keep the colours in place. Create this design using stamping plates. Another thing to be cautious about this nail colour is to keep in mind if you can actually rock in on your nail size. Grow them if you need to otherwise. 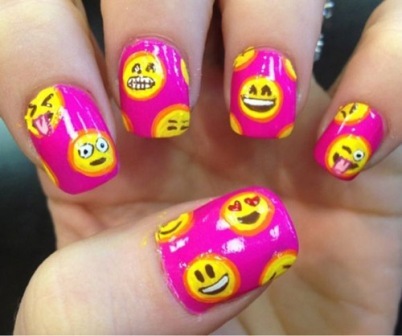 A very creative and artistic nail art. 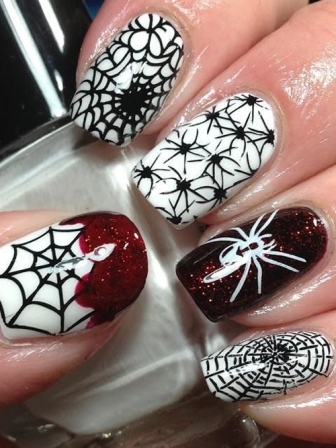 Give it a try but make sure you can draw well on your nails. Kawaii means cute or adorable in Japanese. 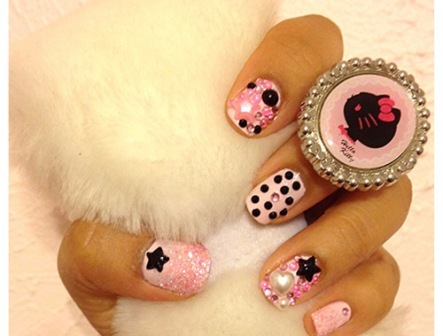 You can try out cute nail designs like this one using good quality nail deco materials. 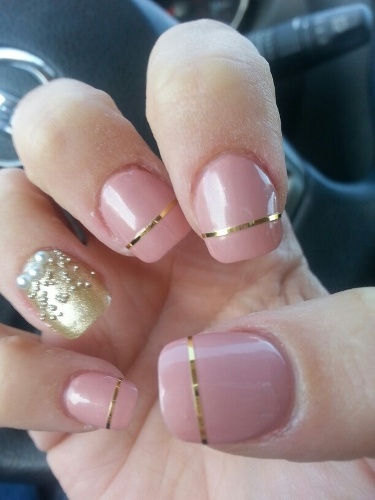 Try out a design like this for a change in those regular French tip designs. Almost everyone loves this. 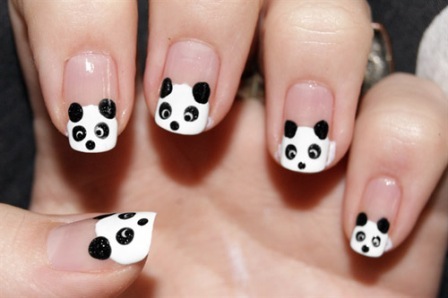 It’s very easy to create panda nails using dotting tools. 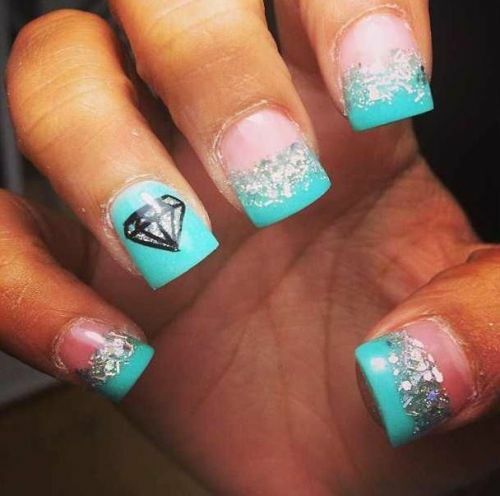 If you are just as lazy as the animal, or at least people think that you are, prove them wrong by undertaking the tedious job of putting this nail art to life overcoming all the hassles that come along in the way. 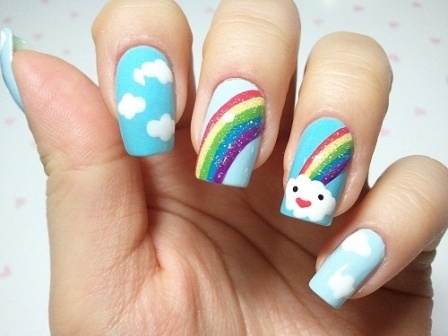 A rainbow nail art design cannot go unnoticed. Use dotting tools for the face and clouds. Use glitter strippers for the rainbows. 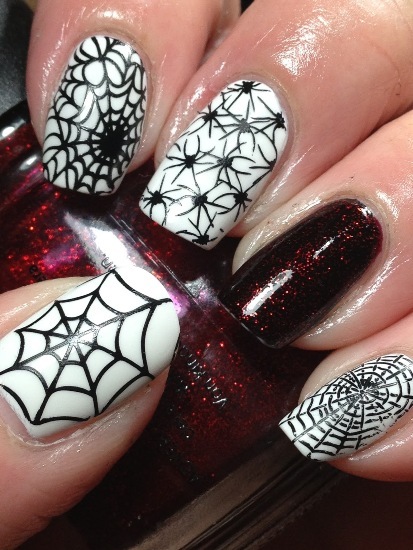 Try out this freehand Halloween nails using dotting tools and nail art brush. Use some black Rhinestones for the cross. If you love flowers in the end, this style will lead you to appeal for a show no matter what outfit you pick. It is equally good for short nails and long ones. 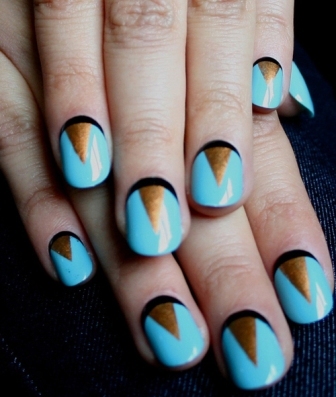 Try this nail art design using a simple toothpick and required colours. 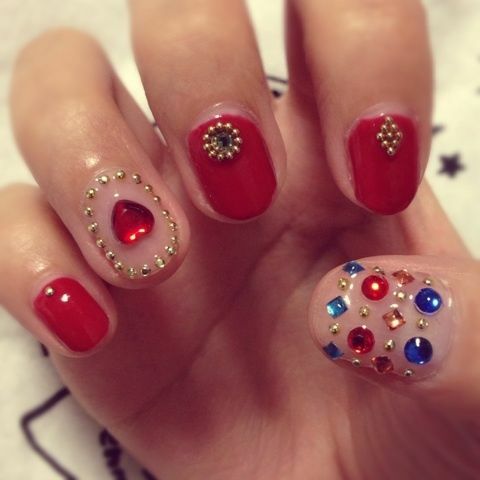 Try out a Bling cute nail art like this one easily with lots of Decos in star and heart shapes and some rhinestones.Use some glitters too. 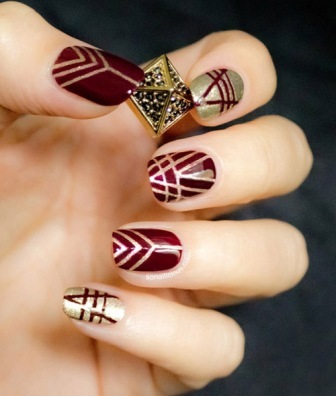 Tribal nails are easy to create with slow and steady hands. You will require your black striper and a few different coloured nail polishes. You will also require some toothpicks. Use the blunt end of a toothpick to pick a certain colour and do not use that toothpick for another colour otherwise colours will get mixed up. Try this one out! Only one finger features the teddy, so you need to make sure you get the look right to finish the deal like a pro. 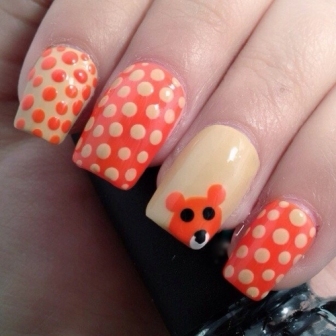 Try out a cute teddy design like this using your dotting tools. The nail colours alternate, so once you get a hold of the design, second time’s easier to manage. This brings down the overall time for the design significantly. This is a nice artistic concept involving both the prints of the animals in a nice pattern. Try it out. It’s very easy to create, and you will need your dotting tools for the lip pattern and the nail art black striper for the “XOXO” pattern. If you have always been quite the fan of the American TV show “Gossip Girl”, you will know that XOXO is everything you can wish for, finally, eh? 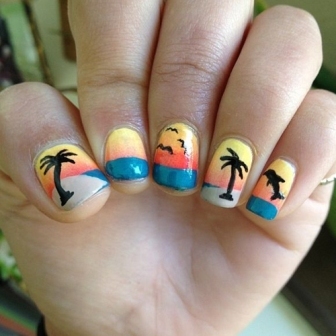 A palm tree nail art is classic nail art. It is very easy to draw also. Use a striper in black for the palm trees and some sponging for the background in different colours. So if you are going to hop to a beach for the holidays then try sporting this nail art to go with your shorts and bright coloured bikinis. 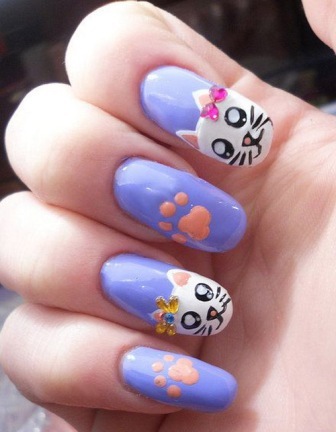 For all those who love cats this nail art is for them to try out. 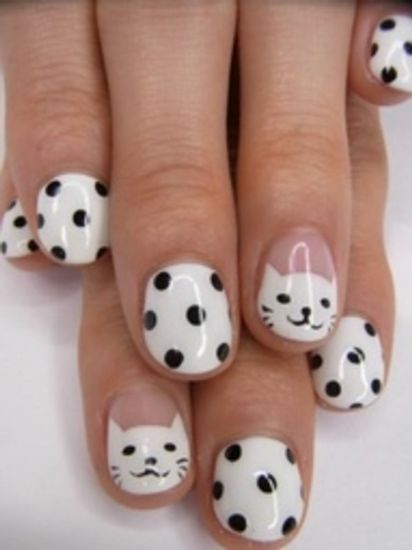 Do the paws using dotting tools and also the striper for the cat faces. Additionally, use some deco bows or rhinestones for the bows at the cat’s ears. 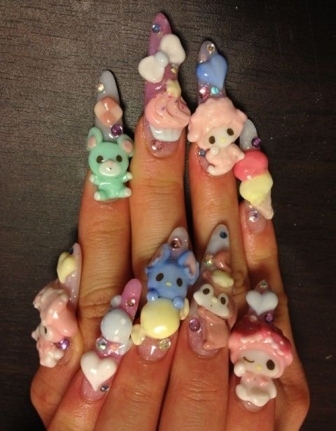 This is complete weird nail art and a bit abstract too. It has an apple, some number, some mathematical symbols and letters. Will you try this out? You may additionally use some transparent matte finish top coat like in the picture to give a matte effect to the black polish. You can use a black matte polish itself also. 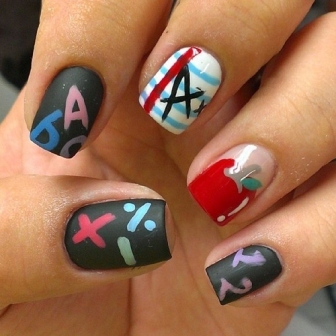 This can be quite a nail art if you are wishing to sport a back to school blackboard nail art. Cats are favourite of many. Some of you must have some fluffy friends too. So why not try out a cute cat face design in yellow like this one? 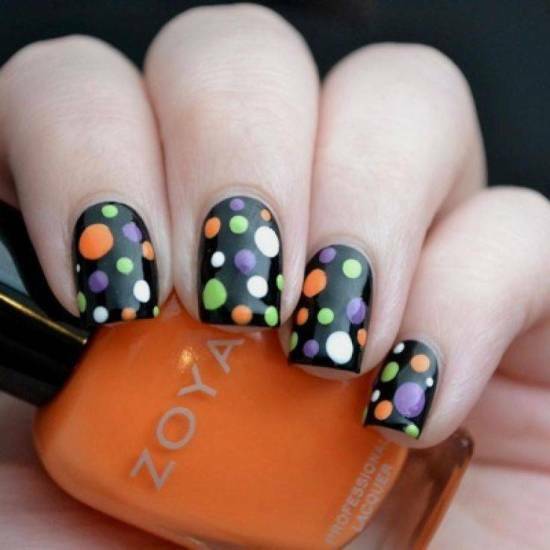 Use your dotting tools for this design. Use a black striper for the whiskers. Seal off your design so created with a transparent top coat. The show stopper is obviously the purple evil minion resembling how we look at life almost half of our years- so relatable, right? 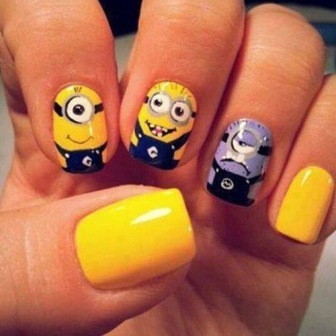 Try out a despicable me nail art like this one using your nail art brushes and dotting tools. 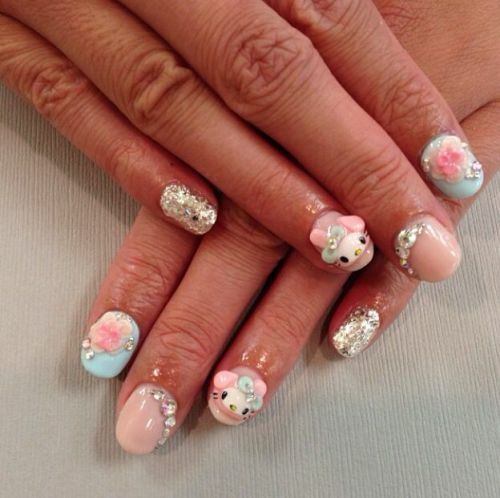 You may not get any meaning out of this nail art, but it sure looks lovely. 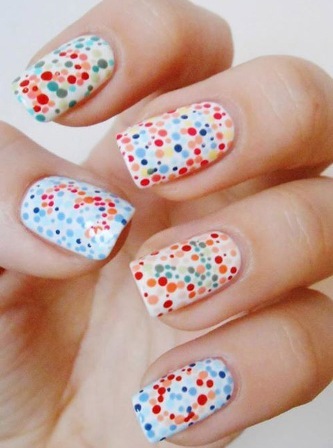 Use your dotting tools to create this nails art. The emoticons look perfectly done up, although, the pink might not favour every skin colour, so take the risk and see how it goes in the end. Will you try it? 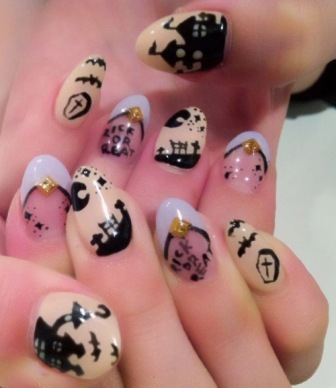 A very chic nail art. 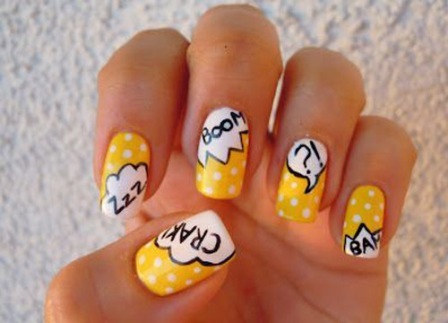 The boom and bam nail art depicting how crackers burst can be quite a nail art for the coming Diwali.Will you try it? 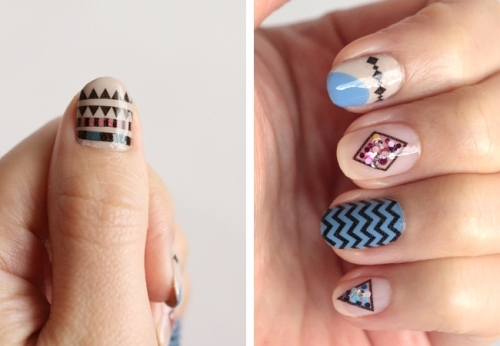 Try out a vintage pattern party nails using two colours and striping tapes. Use alternatively either black or golden as a base. Let it dry. Put striping tapes in order of the design you want and press slightly. Use the contrasting colour over it. Carefully peel off the tapes and seal the design with a transparent polish. 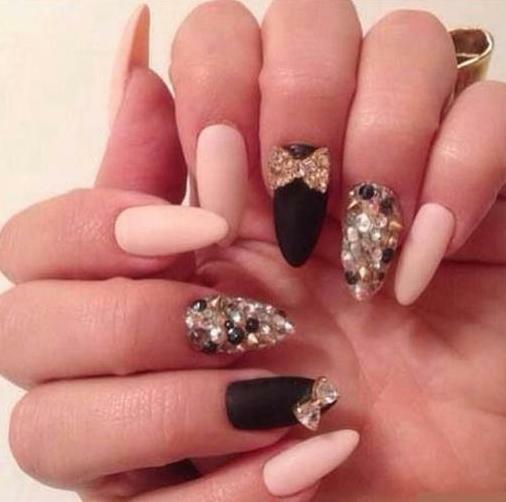 These nails are best suited for feet because feet nails are broader. However, you may try out the same design for your hands too. 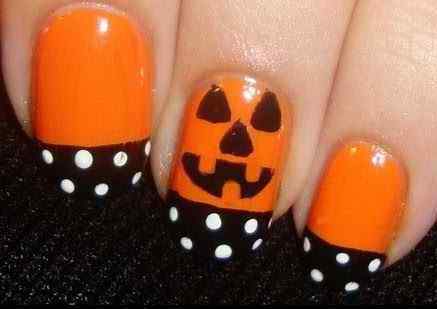 You will require a nail art brush and skills of freehand steady painting for this one. 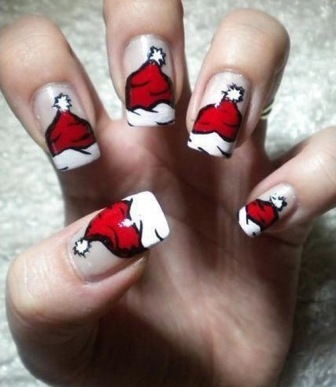 A Santa clause caps nail art can be cute to sport for the coming December. It’s easy to create too. A few trials can make you draw those perfect little caps on your nails. Use your black striper and red polish along with white polish to create those caps. Use dotting tool for the cap’s heat. And use a needle to make the fluffy cap head. Will you try it? This is quite funky. Try this out with normal paints and some freehand drawing. This is easy to do, but you will have to do this carefully. 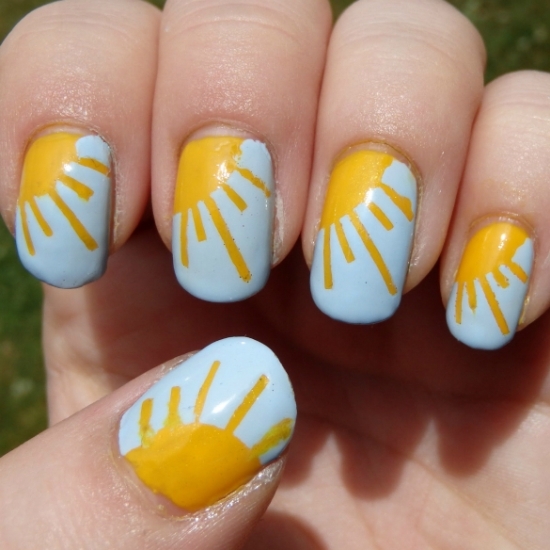 If you have problems, then you can try this out on a piece of paper, and after practising, you can do this on nails. This can be worn for Halloweens. This is in fact, quite easy to do. You can wear this with dark coloured clothes. This easy to do the thing is showy for many beginners. You can wear this for the parties. You can also have fun with your friends by wearing this. This can be done easily. You can also use special materials to go with this. This can be worn with almost any forms of outfits and you will not have to wear this with only some specific get up. 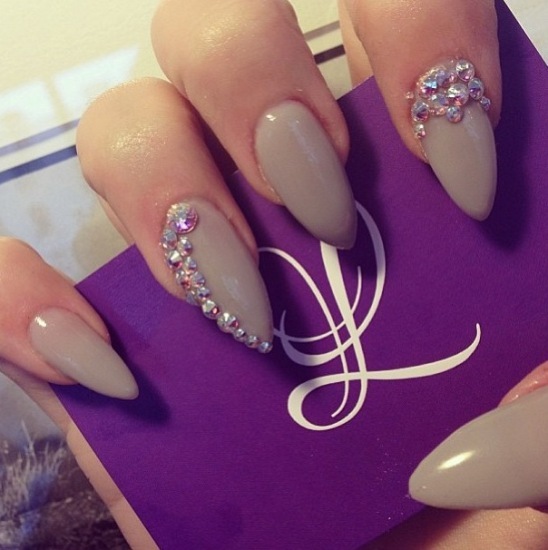 The nail colour is really simple, which is just what makes it classy as well. So, to bring out the very best of this look, make sure you have the right shade before you start and don’t forget that top coat. If you are dressed as something for a costume party, you can try this out. Wear some accessories with this to make this even shower. This can be done with dark paints and dark colours. You can make this scary and also funky depending on your choice. This can be done using materials and also you can do this with a free hand. 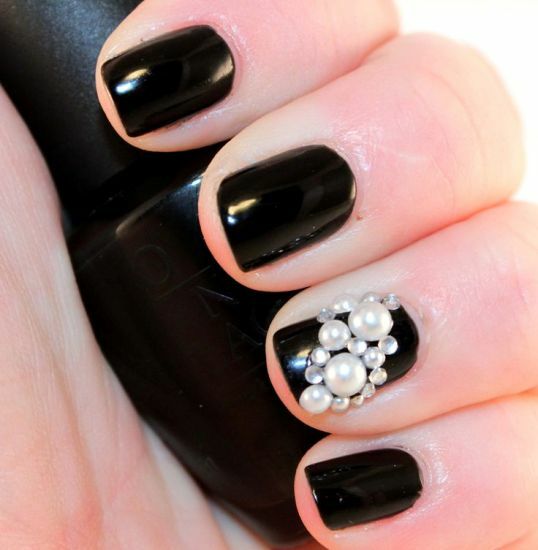 Like here it is quite glamorous though easily done, you can also try this out even if you are a beginner. This can be a funny thing to do. If you have time in your hand, then you should take your brushes out and some colours and starting doing this for yourself. This can be good for parties and also for any other girl night out. If you dare, then you can sport this for college for those times you are wearing something funky. This is a very girly thing that makes girls do. This is quite easy to do at the same time. You can also try this out quite easily. You can buy these from the stores which especially sell these. Then you can take a palette and put some paint of your choice on it and use the tools to create these. You can do this again with the tools as mentioned for the image above this. This can be quite girly, and you can wear this for parties. This can be teamed up with polka outfits and floral skirts. This is quite common, and you can do this even with the blunt end of a toothpick. If you want an easy thing that also looks good, you should try out something like this. This also suits most types of outfits. You can wear this with almost all forms of dresses. Floral prints are quite easily done. You can try drawing something like this with your brushes and equipment. Funky prints are quite common. These types of prints can be good for girls who want to dress up in girly outfits. These are also good if you want to wear something that has heavy zari work or has some glittery works. This is a very glamorous design. Though this is quite easily done and you can try this at home, even then you can wear this for almost all occasions like parties and college. 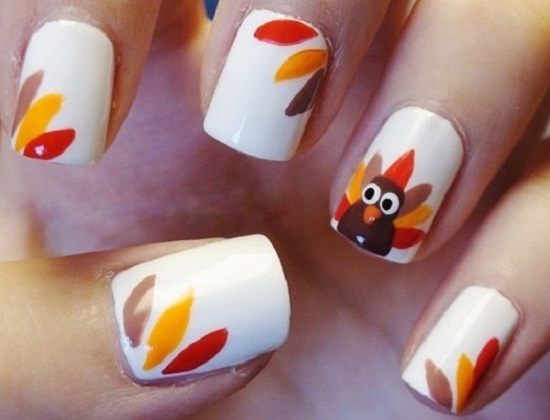 You can use some freehand painting to do these. You can also buy decals for doing these even more professionally. These can be worn for regular ear and also for parties. You can wear these with polka and printed outfit. This looks quite girly. You can also wear these with some other materials like ceramic flowers. You can buy decals and use them. These are easily transferable with plain water, and you can wear this for regular wear. These can be easily bought if you spend a few bucks. These stones are quite costly depending on the shape and colour. If you want something for a party and you want to try something like this, then you should be spending quite some money to get these. These are easy to make. These materials are often available in crafts supply stores, and you can easily make these. These are quite good for parties. You can wear these to college and work. If you are having a girl night party, you can try wearing something like this. This is quite easy to do. You will be able to sport this easily. You can also wear this with sequin outfits. This is quite easy to do. 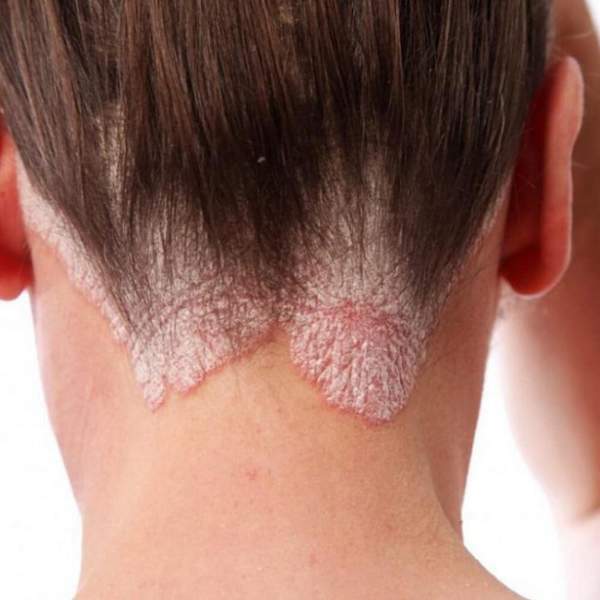 You can follow the simple procedure of dabbing sponge or makeup sponge and then do this. Use a clear base to protect these and a top coat to seal this. You can combine colours like this any that you may like and then use a sponge or a felt tip to create this effect. This can be worn with any multicolour outfit. This is quite trendy, and you can easily wear this with your friends. You should be able to sport this with much ease. You can add more glamorous when you are wearing something like this. This is trendy and will suit most girls. You can wear this with almost all types of floral prints. 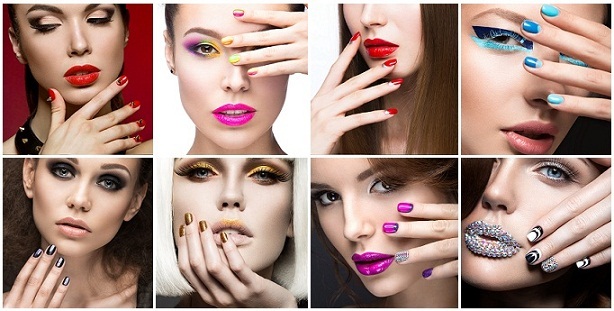 You can sport this look even on the most difficult nail types, without making the whole arrangement look like a mess. This can also be easily done with selected colours. You can wear this for parties teamed with some multi-toned skirts. If you have good drawing hands then doing something like this should not be a problem these are quite easy to do. You can wear this easily for the parties. The thanksgiving time can be celebrated with this. 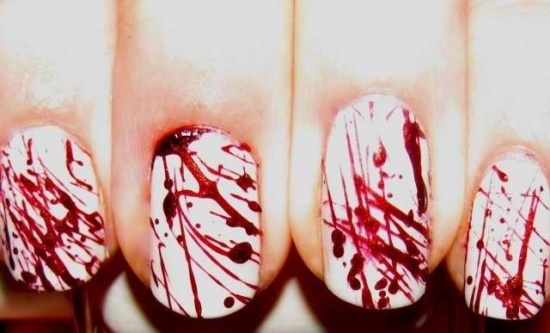 This can be done easily and looks quite girly. This will go with almost any summertime outfit. You can draw some leaves at the sides using your brushes and equipment. Then you should use some top coat to seal that else it may get messy. This is quite an easy thing to do. 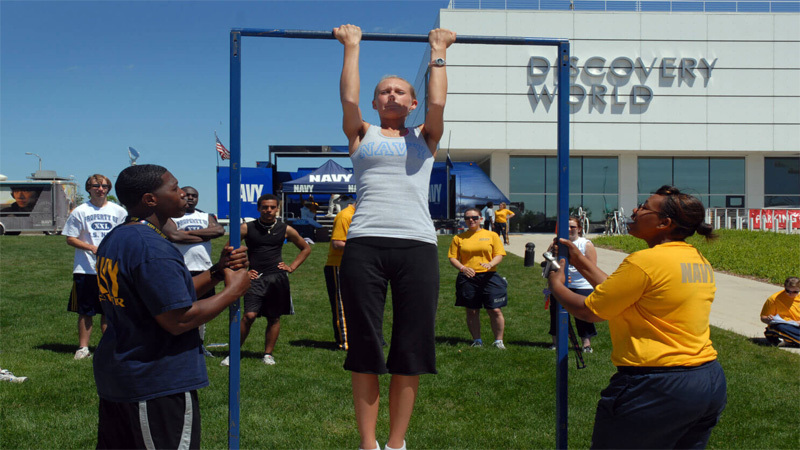 Even beginners can try doing this. This can be done quite easily. You should be able to do this with normal paints and colours. If you have a thin pointed brush then it should not be a problem to get this done. This is an easy to do a thing, and you can wear this for a day out shopping with your friends. You will have to use selected colours and paints from your drawing kit, and then you can do this easily. If you are worried that you do not have good drawing hands and you may not be able to do this. Then you can practice this on a paper and then do this on your hands. Pearls can be easily bought from crafts stores. It will cost you very less, and these are quite cheap. You can use these with a special adhesive which also you can get from special supply stores and which does not harm the enamel. If you think that you have brittle nails, then you should use a thick base coat before you use these. You can add some freehand painting to these. These are quite easily done and easy to sport. You can also wear some metal chains with these. You can buy those from the stores that especially sell those. This is done very easily, and you can too place these in this way to get a similar look. This can go with almost any form of outfits. This is easy to do, and you can wear this for parties. You can also wear these for regular work if you keep the base colour slightly neutral. You can centrally place pearl beads and then use top coats to create patterns. These are quite a showy thing if you want to wear these for your college. 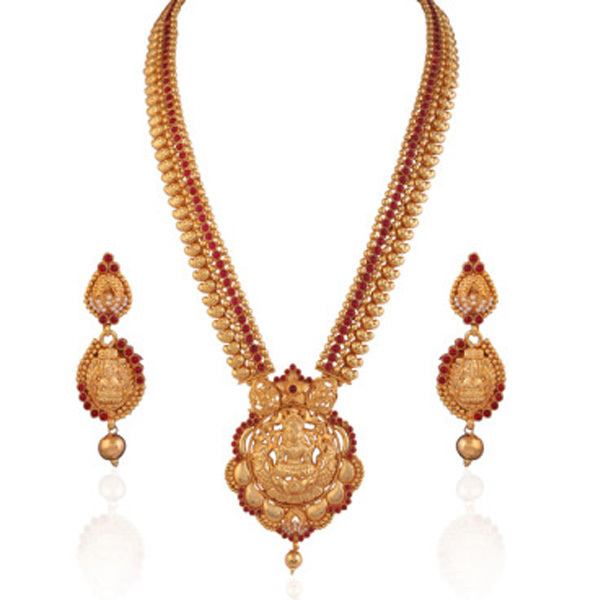 This can also be good for wearing with heavy sarees or jewellery. This can be done with any other chosen colours of your choice. Do not forget to use a thick layer of top coat or use a single layer and then wait and then use another to seal these things in so that they do not fall off. You can use other deco materials along with this to give it more glam. You can wear Rhinestones with this to give it more party like the look. This can be worn for a party. This is quite easy to do. You can do this even if you are a beginner. Also you can wear this for college as well as you can try doing these with your friends for times that you have a girl night party. You can use some decals with these. You can also add chains and small Rhinestones to these. These can be worn with your heavy suits and also with chiffon sarees. If you want something easy to do for a party, you should try this out. You can wear this with some glitters and also you can use foils with these. That can give it a different edge. Otherwise you can also use holographic materials or top coats which are quite easily available these days. Who does not like glitters? Almost every girl likes some glittery effect. This can be worn for parties. You can wear this for college as well you can team this up with your party dresses which have sequin works on them. If you want, then you can wear this for family functions. You will have to buy some loose glitters for this, and then you can apply a topcoat and dust those on them to create something like this. This can be a party thing. If you want something for a show or you want to sport something that you think can be good for those times that you wear a sequins outfit, then you should wear this. This is properly set and can be good. This can be teamed up with something classy. You can wear this easily, and beginners can create this. If you want, then you should try adding more materials to this. However many people find it difficult because materials can get stuck to clothes and can come off. So you have to wear these as per your comfortability. Properly choose what you want to set and then use a clear top coat to seal those in. This can look quite girly if you wear this. This can be good for parties as well. You can use any coloured glitters that you want. Sometimes it can be difficult to find paint colours which suit the clothes that you want to wear for your party or a function. In those cases, you can use any base colour and then use the colourful glitters that you want over them. If you choose a colour properly, then you can wear it without almost any materials. This can be good with dark coloured outfits. You can wear this when you have a proper manicure done on you with almost any dresses and for casual days. You can wear this to work and also to college. This can be a good and new thing which many people are wearing. These are quite popular. You can buy these from stores and easily wear these. Quite a few colours are there from selected ranges which can look very glamorous like this. You can wear this easily. 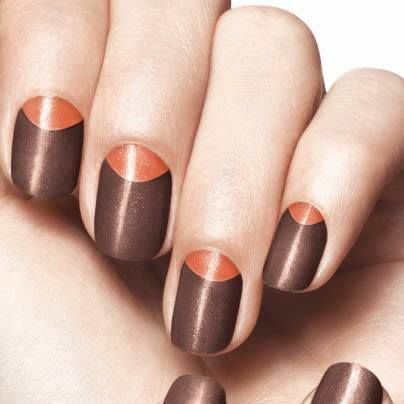 It is a very plain colour but it can be worn with some coats and then use a top coat to make this more glamorous. This can be good for summers. Team with glitter printed outfits. Not everyone likes to use materials. If you select a colour that you can wear and which is either matte or glossy, then you can use some coats of it and then wear that for parties. That also looks quite good. You can wear that for work, and also for shopping days and also college. You can try these out with a brush and some paints. You can also use a toothbrush to do this. Usually, these are very easy to do and quite suitable to sport with almost any forms of outfits. You can wear this to college as this looks trendy and you can also wear these to your parties. This is a very easy thing for a girls nightwear. You can wear this for day time occasions when you are going shopping with your friends. Also you can also wear this with almost any forms of outfits. You can have something similar done when you want to use something for summers. You can easily do this even if you have no experience in doing these arts. You can team this up with almost any forms of floral or polka outfits. Using neon colours will also look quite showy for something like this. This is quite glamorous and very easy when you try. This is quite trendy, and you can do this with any selected paints. You can also wear this for any get together and you can also wear this for parties. This is quite easy to do, and even beginners can try this. This can be suitable for a party. If you are a beginner, then you should try this out. This is easy to do. Special materials can be stuck after you have done this. This is quite showy and good for even work wear or college wear. Use some selected colours and diluted formations to create this. You can split with straws as well. You can also use some special paints to do this. These are a very easy thing that a person can try out. This is Asian, and you can easily do this on your hands. You will need these deco materials, and you can fix these to get this done. This can be good for a party, and you can easily sport this. You can also use other materials like stones and pearls to make this. This can be done with special foils and materials that you can buy from stores which sell these. These are easy to apply and use. You can do this even if you do not have several materials. This can go good for a party. This is a party type thing, and you can use Fimo easily to get this, or you can use materials like shown in the image. This is easy to get and easy to do. You will need to do this carefully, and you can buy special adhesive to stick these. This is another glamorous combination of materials and paints combined with some freehand technique. You can wear this for a party and even to your college. This is quite easy to do and the materials are also not that costly. This is for all those party times that you want to wear something easy to do and you can sport this as well. If you are going to a function, you can make this and wear this. This is also good with polka dotted printed clothing. You can easily wear this. This can be done with special materials which you can buy from crafts stores. You can also get these from stores which specialise in this. If at all you cannot find these then you can ask for something from a parlour. They will be able to give you something like this easily. If you are a beginner, then you should try this. This is quite easy to do. You can do this with some foils as well you can do this with some Fimo. These are very easily available and quite cheap to buy. You can use other material like pearls and stones. You can also use decals to create something like this. Wow! 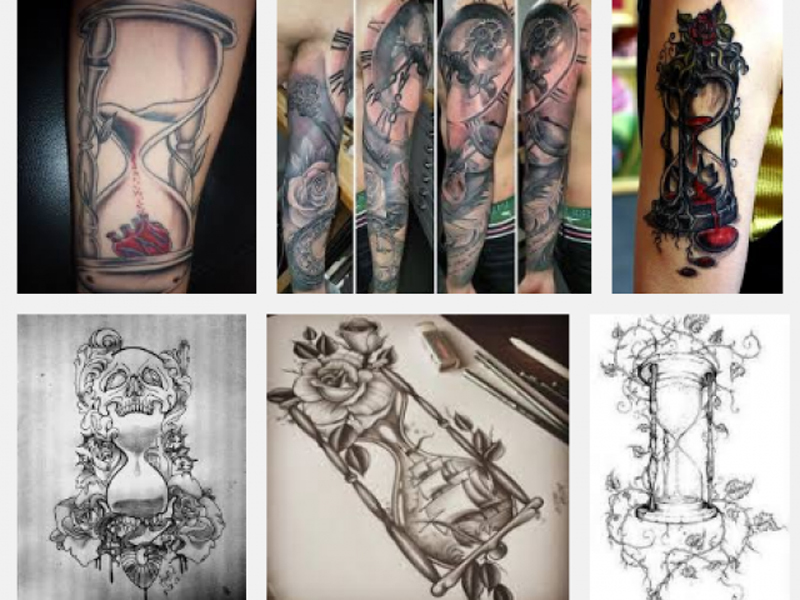 Brilliant and classic Designs. Interesting write-up. Do share more such amazing articles. Will keep digging for more.. This Article is So Beautiful! 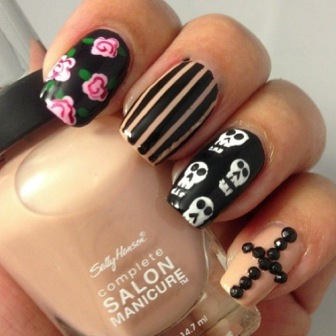 I love the nails..! Thanks for the awesome article. Totally loved these designs. They are so many I loved and want to try them on my nails. The designs are simple and awesome. Great job done!